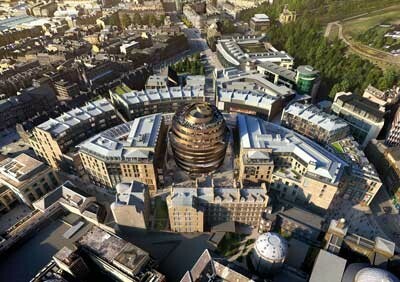 Edinburgh St James is one of the most significant construction and regeneration projects currently under way in the UK and the largest city centre development Edinburgh has seen for decades. The £1bn project is replacing a 1960s shopping centre with 79,000m² of new retail space, alongside a new five-star W Hotel, an Aparthotel, 152 prime residential apartments, more than 30 restaurants and the city’s first Everyman Cinema. 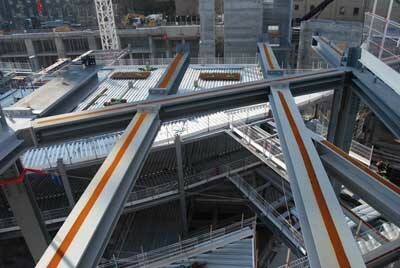 Numerous column grid patterns requiring hundreds of tonnes of transfer structures, are helping to create the large retail-led mixed-use scheme, with a steelwork package totalling 15,000t of steel being fabricated by the appointed steelwork contractor BHC. Following specification by the Architect, Farrat are set to supply over £90k of Farrat TBK Structural Thermal Breaks to thermally separate steel connections across buildings in the project. As of March 2019, BHC had erected approximately one-third of the overall 15,000t of steel, a total that amounts to the company’s largest ever project. The steelwork package is due to complete in June 2020, with the project opening in phases, beginning with the retail and leisure element anticipated to complete in 2020, and the remainder of the development in late 2021 when the W Hotel and residential parts will be ready. Farrat’s BBA certificated Structural Thermal Break materials provide building design professionals with a robust solution to minimise energy loss. Suitable to mitigate against planar, linear and point load thermal bridging, Farrat Structural Thermal Breaks can be used anywhere a penetration or transition exists in a building envelope to help achieve building performance standards. Performance characteristics include low thermal conductivity, high compressive strength and very limited creep under load. Full specifications are available for import from NBS Plus. 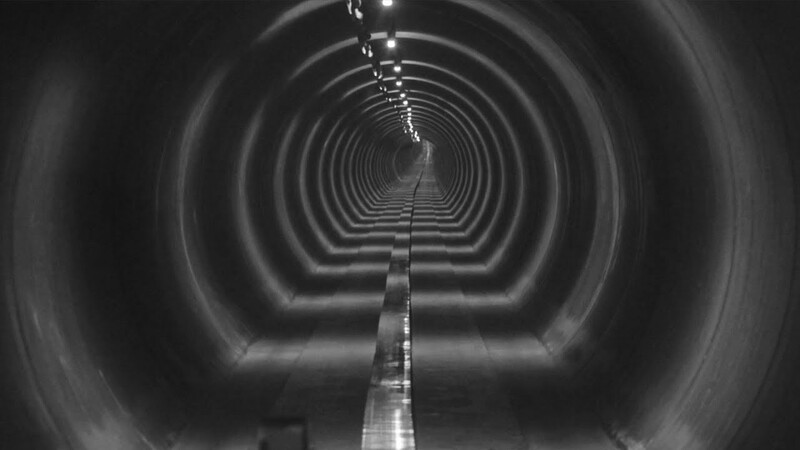 Our Industrial Team recently supplied undergraduate engineers from Colorado School of Mines, with high-performance Anti-Vibration Materials to dampen vibrations affecting their prototype for the 2019 SpaceX Hyperloop IV Competition. The competition intends to revolutionize the worlds transportation systems, challenging student teams to design and build a high-speed pod that can be propelled through a low-pressure tube at theoretical speeds of up to 760mph! Farrat Anti-Vibration Materials will help to stabalise the prototype pod wheels when travelling at high speeds, damping vibrations ranging from 0 to 30 Hz. We do not want to give too many details of the vibration damping system away ahead of the competition entry submission, so in the meantime, take a look at the competition trailer below or learn more about Farrat Anti-Vibration Materials for Industrial Applications here. Designing a resilient support or connection and selecting the correct vibration isolating or damping material for it can be complex, but Farrat’s Industrial Team are here to help. We can guide you in your selection, so that you are confident that the material supplied is the optimum solution. Please contact us with your specific requirements and we will work with you to develop a solution that considers: performance, longevity, environmental conditions, installation and budget. 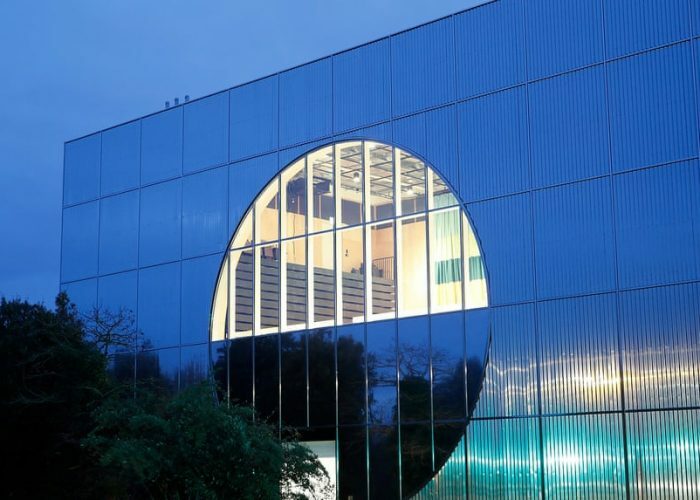 The long-awaited extension of ‘MK Gallery’ in Milton Keynes, opened its doors to the public at the weekend after being hailed as “an architectural gem” by national media. Designed by two artists in collaboration with London architects 6a, the £12m extension includes five new exhibition galleries and a Sky Room auditorium, acoustically isolated using the Farrat CineFLOOR PRO acoustic floating floor system, which was installed by AcouStruct Ltd. 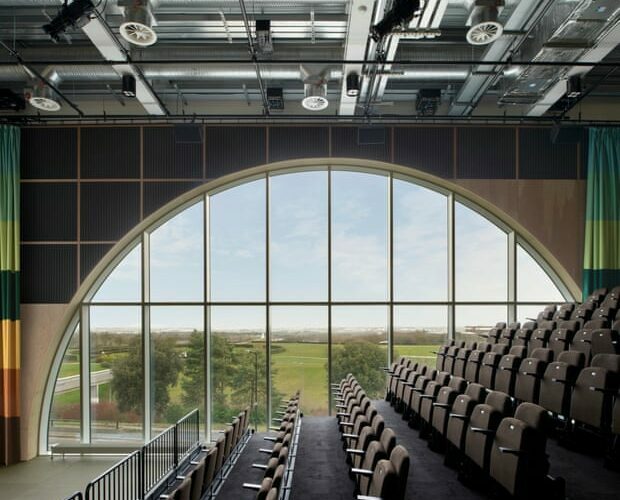 The Sky Room auditorium is housed in a new building for MK Gallery, which is located at the top end of Midsummer Boulevard where the city meets Campbell Park, establishing the centre of a new arts quarter. The auditorium will be used for film, performance, lectures and large screenings with a sizable audience capacity, accommodated by sliding bleachers. Farrat has designed and delivered acoustic isolation solutions for many of the world’s largest and most striking multiplex cinema projects and the Building Acoustics team at Farrat has decades of experience creating state-of-the-art acoustic environments within cinemas. Farrat are currently helping to deliver a cost-efficient and sustainable HQ building for the Centre for Environment, Fisheries and Aquaculture Science (Cefas) by thermally insulating the exposed steel frame using Farrat Structural Thermal Breaks. Based in the Suffolk, the UK marine science agency Cefas (The Centre for Environment, Fisheries and Aquaculture Science) is constructing a new £18.3M contemporary headquarters building. 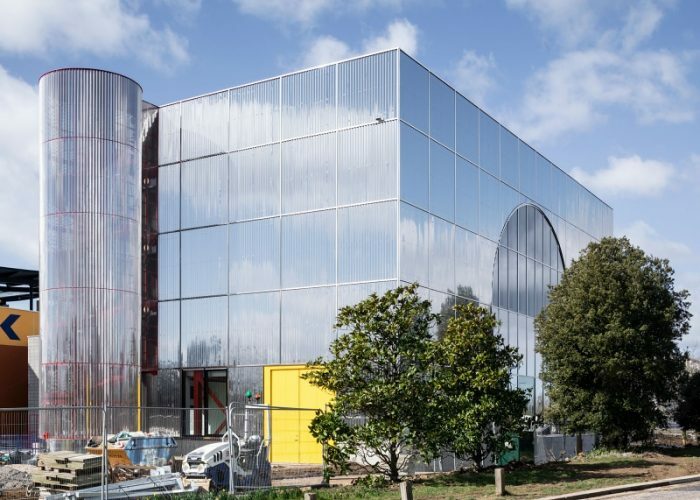 The new headquarters will be a sustainable steel-framed landmark and form a central element of a much larger scheme that also includes the phased floor-by-floor refurbishment of an existing 1980s laboratory building. The building has a composite design with steelwork supporting metal decking and a concrete topping. 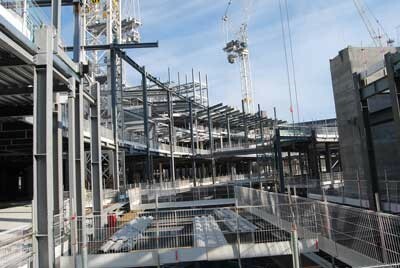 Most of the steel frame is based around a regular 6m column spacing, with internal spans of up to 12m. This was deemed sufficient to provide the new building with modern open-plan office and meeting room spaces. Farrat were recently contacted by the steelwork contractor to help minimise the risk of thermal bridges forming at several different penetrations and transitions in the building envelope. As the complete system needs to be optimised structurally as well as thermally, Farrat are supplying a combination of Farrat TBK and Farrat TBL thermal break plates in a variety of thicknesses and bespoke hole configurations, to ensure that the system is robust as well as thermally efficient. The high compressive strength and low thermally conductivity properties of these Farrat Structural Thermal Break materials mean that they will transfer high loads and absorb any bending moments or shear forces, whilst acting as a thermal insulator. The Cefas project is expected to be complete by May 2020. Farrat’s BBA certificated structural thermal break materials provide building design professionals with a robust solution to minimise energy loss. Suitable to mitigate against planar, linear and point load thermal bridging, Farrat thermal breaks can be used anywhere a penetration or transition exists in a building envelope to help achieve building performance standards. Performance characteristics include low thermal conductivity, high compressive strength and very limited creep under load. Farrat’s new cinema floating floor range, CineFLOOR, was recently used to acoustically isolate the first VOX Cinema in Egypt located inside North Africa’s largest shopping mall. In this Case Study, we overview the acoustic challenge faced by the project team and the solution supplied by Farrat. The Mall of Egypt, which officially opened in 2017 in Cairo, was developed by Majid Al Futtaim at a cost of USD $708m and is the largest mall in North Africa spanning 400,000 sq.m. 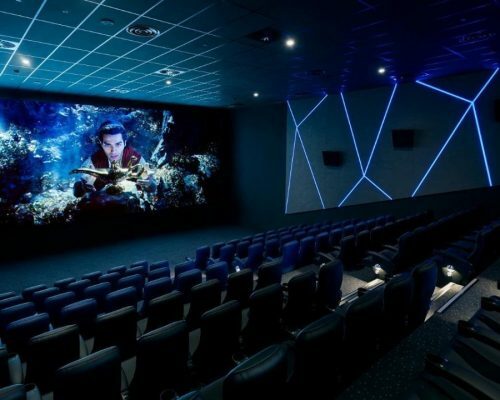 The two-story complex brings Egypt’s first VOX Cinema, with a total of 21 theatres housing; 1x 4DX screen, 4x Gold screens, 1x IMAX screen, 2x screens for kids and 13 regular screens. With a total of 2473 seats, the design and build of the cinema auditorium required expert configuration to ensure maximum entertainment value for viewers inside and minimal disruption to the surrounding 165,000 sq.m of retail space. The brief was particularly challenging as cinema auditoria were adjacent vertically as well as horizontally. Farrat were contacted during the design phase to design, manufacture and supply a workable sound insulation system, to acoustically isolate the 21 auditoria to VOX’s high acoustic performance standards. Following an initial enquiry from the client’s architect, Farrat met with the main contractor and local architect in Egypt as well as the acoustic consultant in the UK, to discuss the full acoustic requirements of the project. It was determined that a minimum Natural Frequency of 12Hz was required within each theatre. After reviewing the requirements against the Farrat range, Farrat CineFLOOR PRO was identified as the most suitable and versatile grade of acoustic isolation to configure the acoustic floating floors within all 21 auditoria. CineFLOOR PRO is the most frequently specified grade of cinema isolation, as products within this range offer the highest ratio of acoustic isolation performance vs. price in the market. 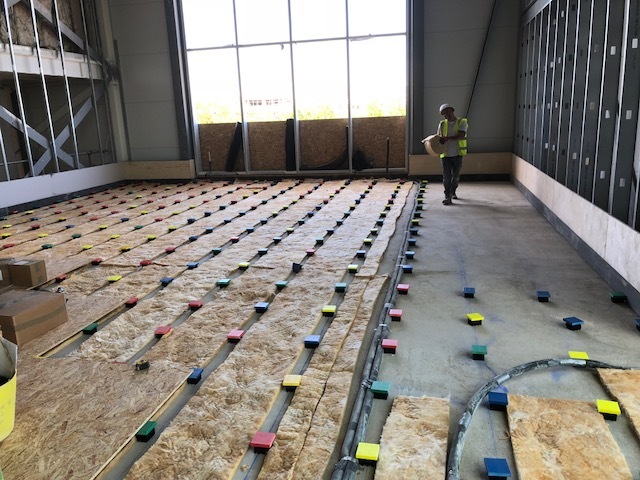 The floors were also reinforced using CineWALL PRO as partition isolation – soon to be released to the wider market in 2019. 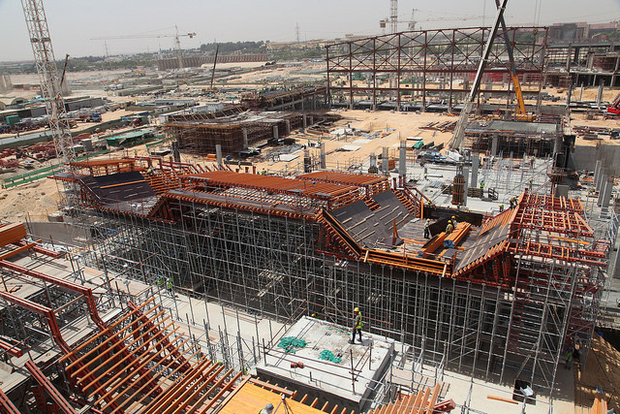 Once the CineFLOOR systems were manufactured, Farrat worked closely with AL Dhabi Contracting to liaise importing and installing the systems on site in Egypt. AL Dhabi Contracting were founded in 1998 and are an authorised Farrat distribution partner in Egypt. AL Dhabi Contracting is also one of the largest drylining companies in the country and represent a number of prestigious UK drylining brands in the region, including Farrat. 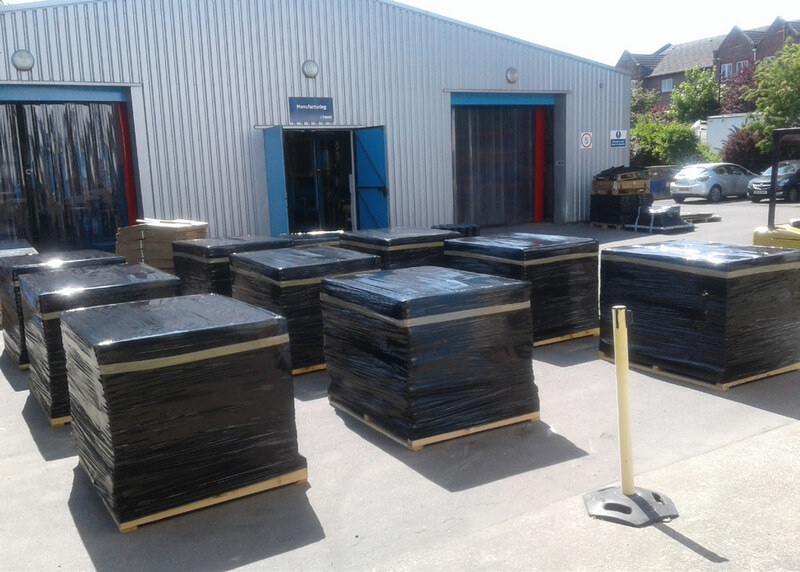 Farrat handled all export logistics including packing materials in secure IPPC heat-treated pallets certified for airfreight to Egypt, as well as all export documentation including Certificate of Origin and Certificate of Conformity. AL Dhabi Contracting then handled all import logistics including customs tariffs and delivery to site. 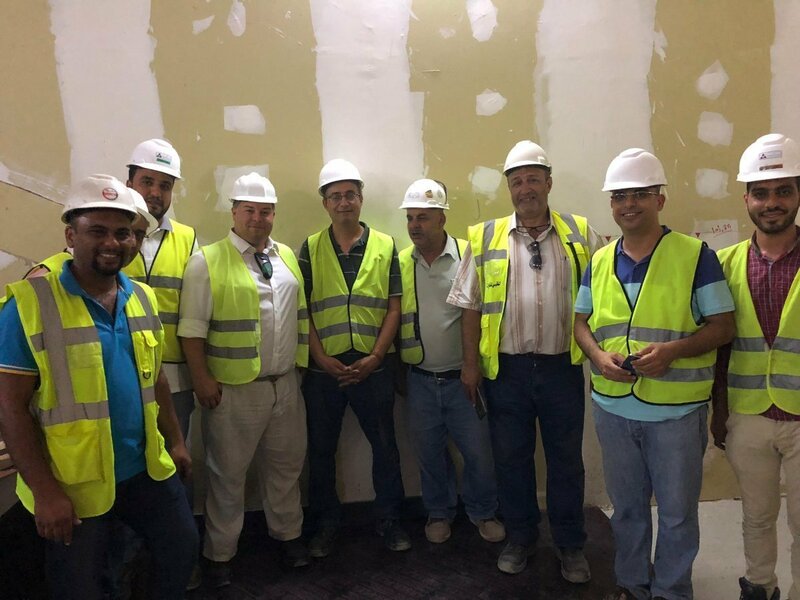 Once the materials arrived in Egypt, Farrat visited site on a number of occasions to inspect the integrity and placement of the acoustic isolators and to train AL Dhabi’s installation team. Overseeing the installation process in this manner ensured that all details were correctly constructed and that the acoustic specification was fully achieved. All 21 screens are fully acoustically isolated and open to the public at VOX Cinema, Mall of Egypt. Both the architect and the acoustic consultant are satisfied with the quality of the Farrat acoustic detailing, which meets the acoustic specification and the clients high acoustic standards. The structural steelwork has just been erected and will house a new 13-screen Cineworld cinema complex, that will be fully acoustically isolated by Farrat. The mixed-use scheme is set to transform a large part of Warrington town centre when it opens in early 2020. Main contractor Vinci Construction started on site in September 2017, after a major demolition phase had been completed. According to Vinci, the project team chose a steel framing solution for the whole scheme because of the material’s speed and ease of construction. In addition to the 13-screen cinema complex, the project will include ground floor and mezzanine retail outlets, a new indoor market hall, a four-storey council office block and a further two-storey retail building. The new buildings will all be set around a large public square, while along the adjacent Bridge Street, the scheme’s Market Hall incorporates a Grade II listed former Boots building façade. 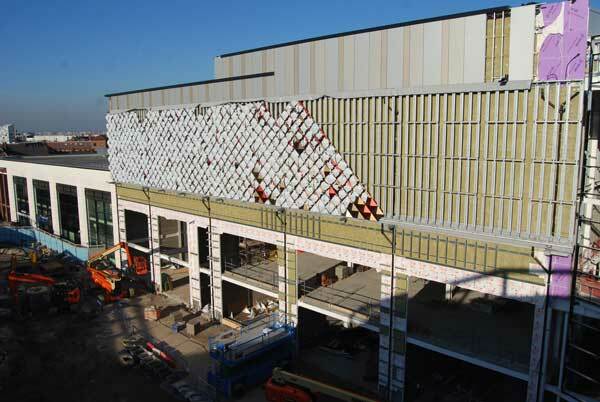 The cinema block has a complex design that incorporates two distinct grid patterns, one for the retail zones and the other for the cinema screens. Acoustic isolators from Farrat’s new Cine PRO ranges will be integrated within the floors, walls and steel raked seating structures to contain noise and vibration at each of these sources, to avoid disturbing the adjacent auditoria. Farrat CineFLOOR PRO isolators will be used to configure the acoustic floating floors, complimented using our new CineWALL PRO as partition base-track isolation. Our new CineSTEEL PRO isolators will be integrated within the raked stadia seating structures, to provide live load deflection at low natural frequencies. The £130 million mixed use development will see completion in 2019. The recent €1.4bn (£1bn) investment into the new manufacturing facility in Nitra, Slovakia, marks the first time a UK automotive company has opened a plant in the country. The 300,000m² facility stands at the forefront of aluminium manufacturing and engineering expertise in Slovakia and has been designed with the flexibility to enable smart, connected manufacturing technologies that will support improved process efficiency and deliver up to 150,000 vehicles a year. Farrat worked with the Structural Engineer and Project Personnel to ensure that a variety of machines within the plant were sufficiently isolated and capable to inspect at high speed with precision. This included engineering and bespoke-manufacturing components for several vibration isolation systems for robot mounted non-contact sensor systems, CMM’s and Presses across the production line. Farrat ISOFOAM120 was installed on the walls of machine foundations to provide lateral isolation. 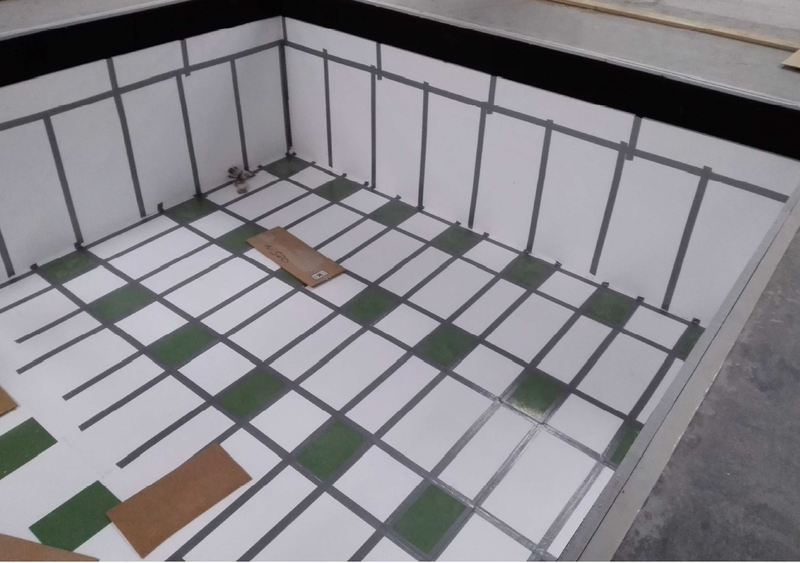 This system is typical where a high stiffness foundation is critical but a degree of active or passive isolation is required, even if only from the risk of random events such as dropping heavy items nearby. Over 1,000 ISOMAT pads of various rubber compounds and sizes, were then used to fine tune dynamic natural frequencies and stabilise each machine for optimum performance. Farrat ISOMAT Foundation Isolators are the cornerstone of Farrat’s Isolated Foundation Solutions. Our ISOMAT pads have a unique profile coupled with a selection of our elastomers and thicknesses. Due to extensive testing and experience, Farrat ISOMAT pads deliver highly predictable performance characteristics over many years of service. Farrat ISOMAT is produced in 3 elastomeric types: IMBR, IMCR and IMNR. Large automotive manufacturers and leading OEM’s are increasingly designing facilities and machinery to work faster and with more precision, whilst reducing weight and cost. Farrat Isolated Foundations are consequently integrated into factory design to ensure that the operating conditions (in terms of vibration levels) are controlled to within equipment specifications, to maximise productivity and conform to H&S and local authority requirements. Whether you are relocating existing machinery, installing new equipment or are involved in detailing foundations, Farrat have the knowledge and experience to provide the right Isolated Foundation solution for your production facility. Farrat has designed and delivered industrial vibration control solutions for many of the world’s largest and most complex projects in the automotive, canning and aerospace markets. Whether you are relocating existing machinery, installing new equipment or are involved in detailing foundations, Farrat have the knowledge and experience to provide the right Isolated Foundation solution. The first cinema ever to be built in Jeddah opened its doors yesterday at Red Sea Mall, fully acoustically isolated using Farrat CineFLOOR PRO systems. The VOX Cinemas multiplex is owned by Majid Al Futtaim and has a capacity to seat an audience over 1,400 people. 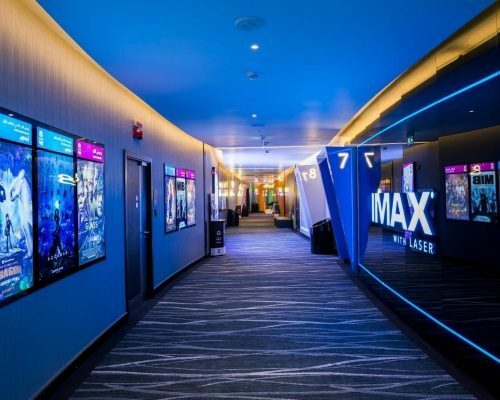 The Red Sea Mall cinema features 12 screens in total, including Saudi’s largest IMAX viewing experience and three GOLD by Rhodes – a new dining concept where cinema guests can order gourmet meals directly to their cinema seats. Farrat was contracted to design, manufacture and supply CineFLOOR PRO isolation systems for each auditorium following recent successes acoustically isolating similar VOX cinemas at The Mall of Egypt and City Centre Sharjah. 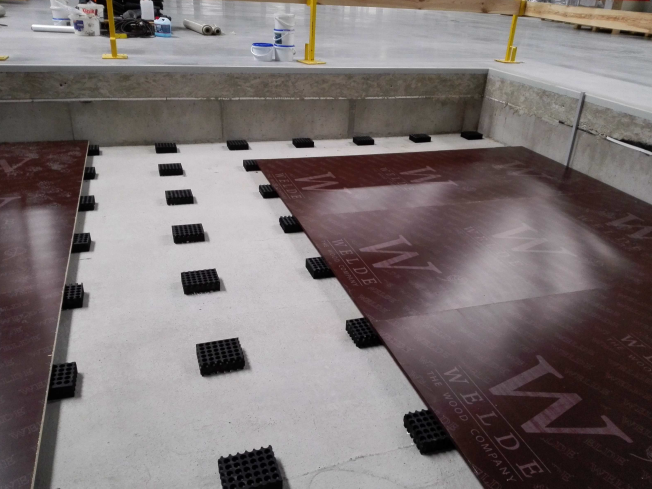 As our most frequently specified grade of acoustic floating floor, CineFLOOR PRO suffers no compromises from low mass or high stiffness isolators to achieve the high acoustic isolation performance standards required by VOX. Full Case Study on VOX Red Seal Mall to follow. 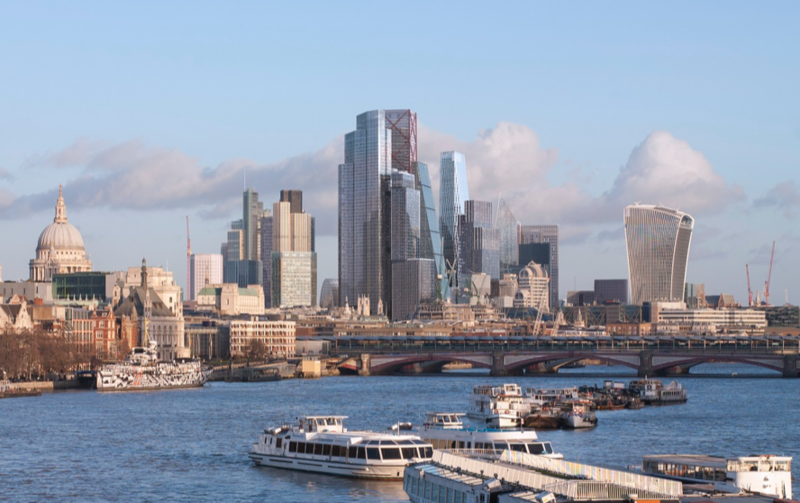 22 Bishopsgate is one of 13 major build projects expected to change London’s skyline by 2026. Designed by PLP Architecture, 22 or ‘Twentytwo’ Bishopsgate stands 278 metres tall as the City of London’s tallest tower within the financial districts new ‘City Cluster‘. The tower provides over 1.2 million sq ft of office space and can accommodate up to four tenants on each of the 62 floors. 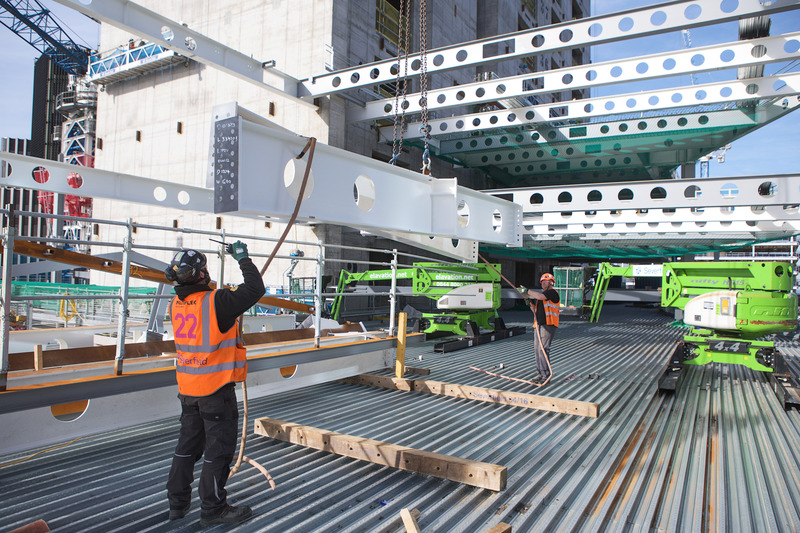 Over 17,000 tonnes of superstructure structural steelwork and metal decking was designed and fabricated for construction by Severfield, who approached Farrat during fabrication to supply a suitable solution to mitigate against thermal bridging between connections. Superelevations, axial shortening and complex geometrical dilemmas presented challenges on this project, so Farrat worked closely with Severfield to manufacture a package of structural thermal breaks in various sizes, shapes and thicknesses to fit seamlessly into design details and meet specification. Farrat’s load-bearing structural thermal break material with the highest levels of compressive strength and thermal insulation, was used between steel-to-steel connections to prevent thermal transfer from the exterior of the structure into the internal structure via the steel framework. 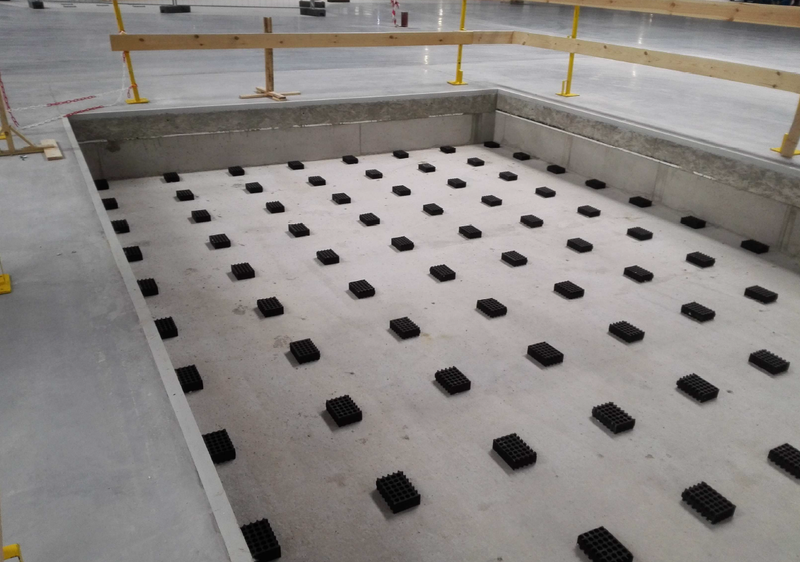 Farrat thermal break plates were also used in steel-to-concrete applications to greatly reduce heat loss into the concrete slab, providing better insulation for the structure overall. For in-depth technical information on all our grades of thermal break materials, please head over to our Thermal Breaks page, or alternatively you can contact us. ‘Twentytwo’ Bishopsgate is due for completion later this year. 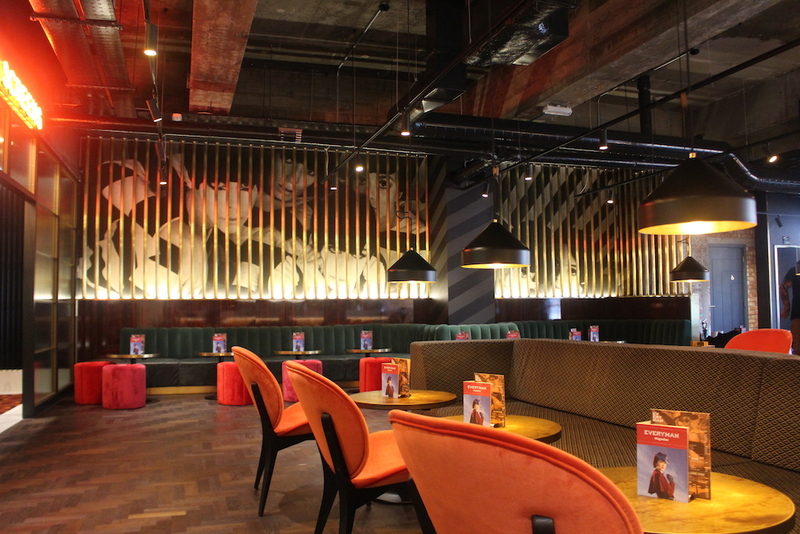 Everyman Altrincham officially opens it’s doors! 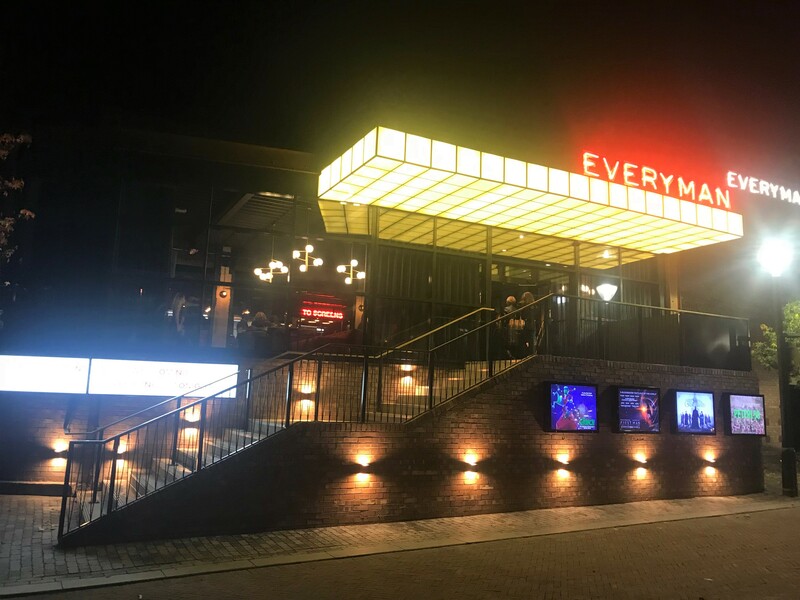 The highly-anticipated new Everyman Altrincham opens its doors today following a week of VIP screenings. Earlier this year we took our team on a tour of the site during construction following the manufacture of a fully-integrated acoustic isolation system designed for each of the four boutique auditoria. It’s not often that Farrat design, manufacture and supply acoustic isolation for a project so close to home, so it was fantastic to get a first-look at the site. During last nights official launch we took a look around the completed venue. 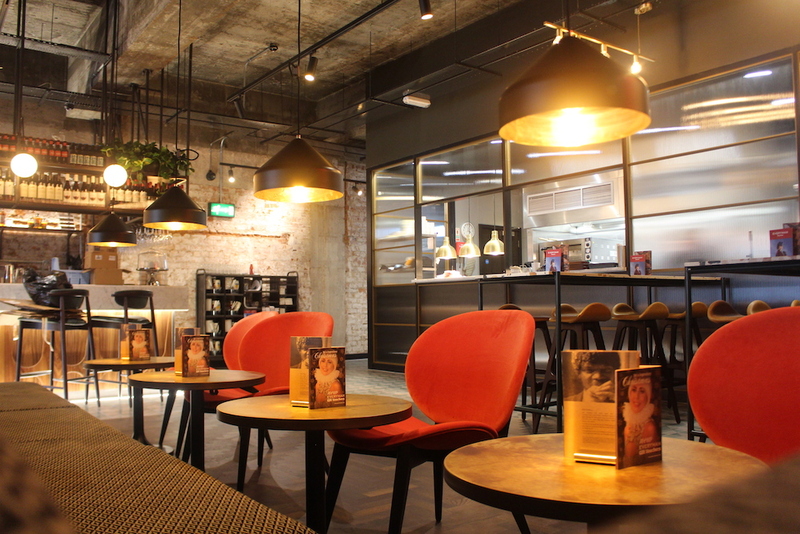 Everyman Altrincham public spaces have been divided into a variety of lounge and dining areas. The bar combines luxurious finishes set against exposed brick and steel with views through to a semi open kitchen. The auditoria corridor leads from the public space to the 4 auditoria, each of which have their own distinct character. Signature Everyman sofas are upholstered in a variety of velvet finishes and the back drop of walls and floors are clad in rich colours and textures. 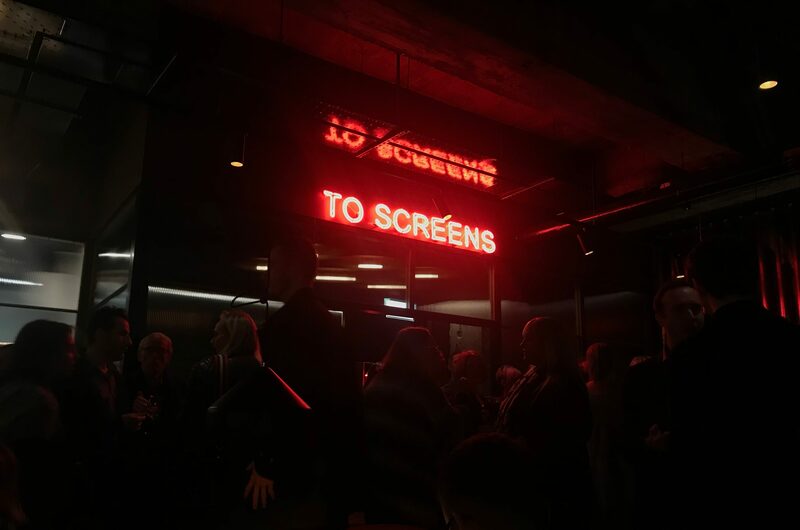 There is a menu offering a variety of drinks, hot food and snacks which can be consumed in the bar or received via waiter service directly to cinema seats. Acoustic isolation was critical on this project, due to the proximity and function of each of these separate spaces. There is an increasing trend for buildings and spaces to have multiple uses, therefore designers must consider disturbing noise and vibration frequencies and their harmonics, to ensure sufficient levels of noise and vibration isolation are achieved. Specification details for the Farrat systems used in this project are available on NBS Plus. 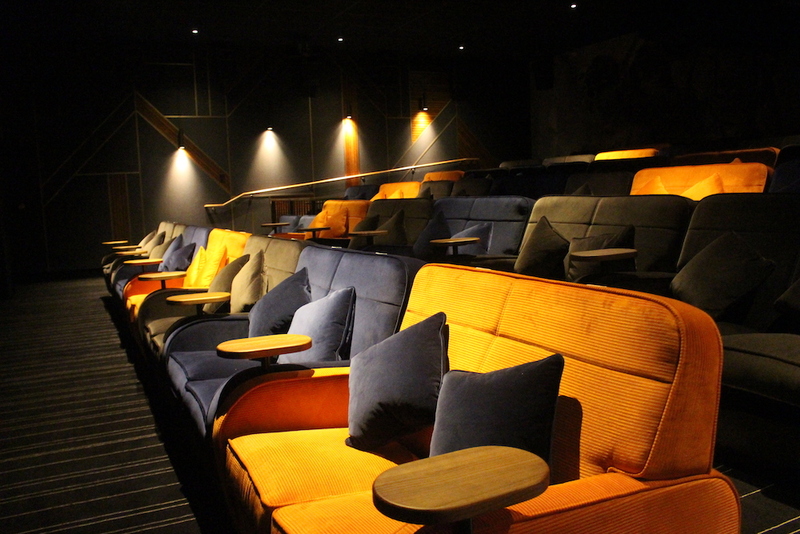 Everyman Altrincham is a fantastic addition to the Everyman portfolio and certainly a special cinema acoustic isolation project for Farrat.